It’s Throwback Thursday! I wrote about two owls back when we first moved into this house. Choosing my friends wisely has made it much more fun for this introvert to socialize. Here’s the newest addition to my flock. This lady has yet to tell me her name. What do you think it should be? She’s a good supporter when I’m frustrated and need to talk. My personal cheerleader, that owl will listen. This entry was posted in Uncategorized and tagged acceptance, cheerleader, disapproving owl, extrovert, friends, introvert, listen, Mo, nonjudgemental, owl, owls, socializing, throwback thursday on December 17, 2015 by quiltartbymegan. I made a new friend last night. We’ve known each other for years. She’s my neighbor. It all started when I showed her my studio. The conversations are private but here’s what my studio looked like after an hour. We bonded over art and stories. 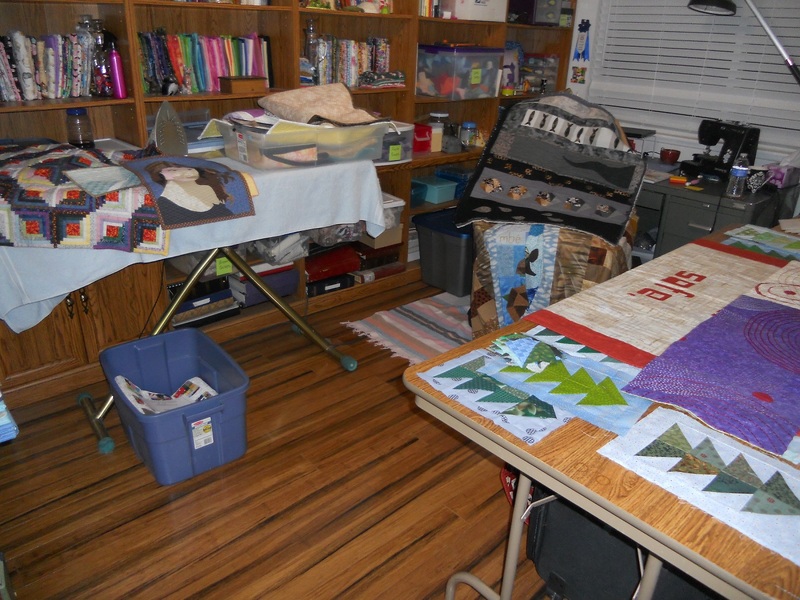 Can you see how many quilts are laid out? So much fun. 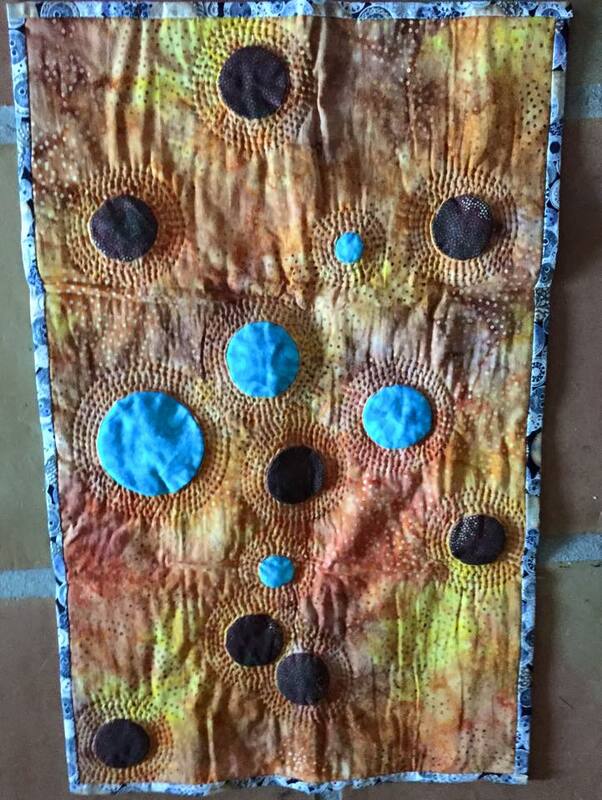 This entry was posted in Art, Artist's Studio and tagged 31dayblogchallenge, bonding over art, friend, friends, honest craft room, neighbor, sharing, studio on December 6, 2015 by quiltartbymegan. Hello everyone. We’re putting moving soon and looking forward to our next adventure. Wish us luck and buy my stuff! LOL seriously though, this is good news for you. In an effort to have less things to pack up in boxes and move I’m discounting all of my items for sale in the etsy shop. They’re now 30% off. No coupon code is needed as I’ve adjusted the price of each individually on the listings. I’ll be adding items to the shop over the next few days so check back for more cool stuff, all 30% off their original prices. I had a great time recently having a booth at the Purrs and Paws Holiday Boutique. My friend Adva surprised me with a visit (yay!) and took this photo. I learned a lot and did a bit of networking too. I’ll tell you all about it in another blog post. Blog post, you say? They’ve been few and far between for a few months now but that’s about to change. Cheryl Sleboda of muppin.com will be blogging every day in December. She’s invited other writers to join her and I’ve decided to participate. So buckle up everybody and find your reading glasses ’cause there’s going to be much more action on this site soon. This entry was posted in Art, Artist's Studio, Booth, Our House and tagged 30% off, blogging challenge, booth, boutique, Christmas, etsy sale, etsy shop, friends, holiday boutique, moving, my booth, purrs and paws, sale, tree skirts on November 22, 2015 by quiltartbymegan. Our brand new bathroom counter cracked. I heard it from the kitchen and came running. My husband was leaning against the side of the counter while installing the hand-towel holder and it gave out. How did this happen? 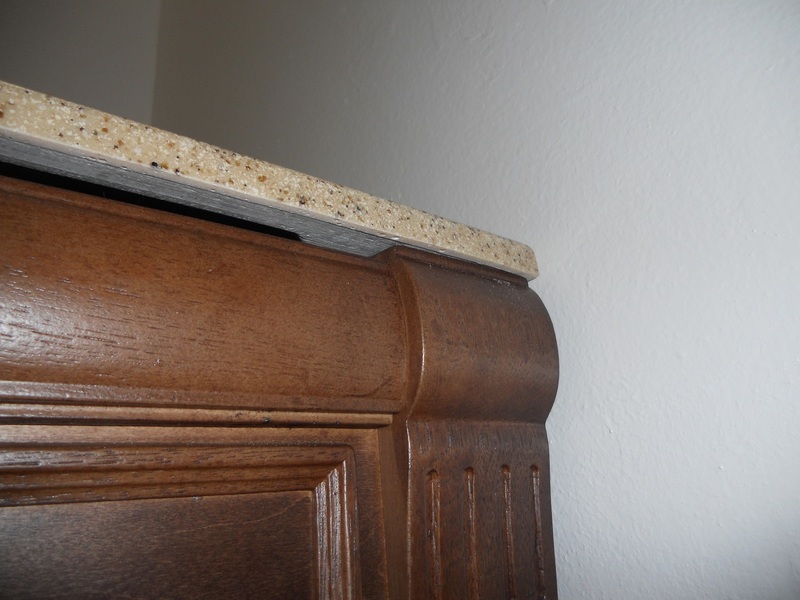 Can you see the gap between the counter and the wooden cabinet? That’s the problem right there. There’s no support. The store exchanged the broken bits for a whole and we started over. This time my husband cut some wood and glued/nailed it to the inside of the vanity. It was a design flaw. The sink needed more support. We all need extra support sometimes. My quilting buddies are helping me with these place mats. They’re cool, huh? The conversation’s ranged from confidence to marketing with many ideas that are new to me. Don’t be afraid to ask for help. 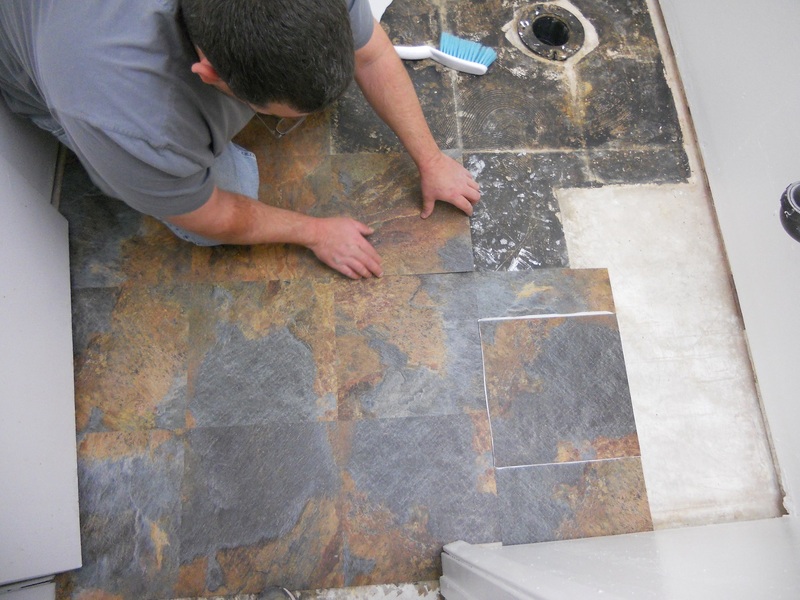 Our bathroom looks much better now. The counter cracking was a bummer but I’m glad it happened when it did. We got it exchanged and added supports and can be confident it’s sturdy as well as pretty. This entry was posted in Family, Our House, The Business and tagged artist, bathroom remodel, before and after, broken sink, business advice, cracked counter, cracked sink, crumb piecing, friends, gap under sink, home improvement, house, just add support, kitty approved, marketing and pricing, place mats, supports, wooden support on April 6, 2015 by quiltartbymegan. What is that? It’s a dog, or a watermelon or a goat, or whatever it is that you see. 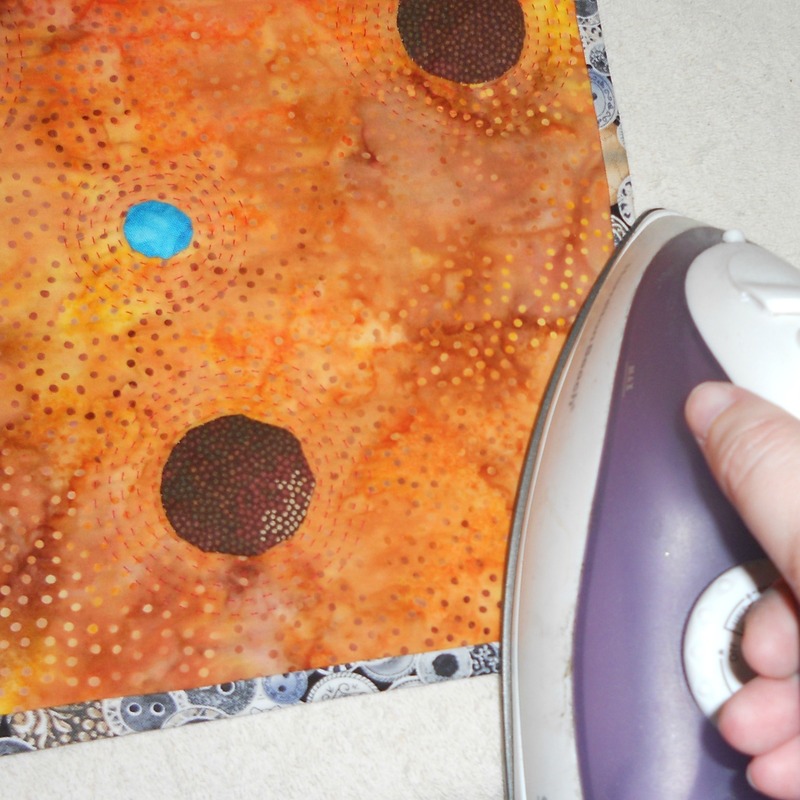 This is the piece of art that’s the topic of tonight’s conversation with some of my quilting friends. We have monthly challenges and come together to share our works. I usually sew something. This time I got my camera out to play. My first idea was a mosaic with buttons. It’s cute and was fun to scrounge up all those pink and red buttons. 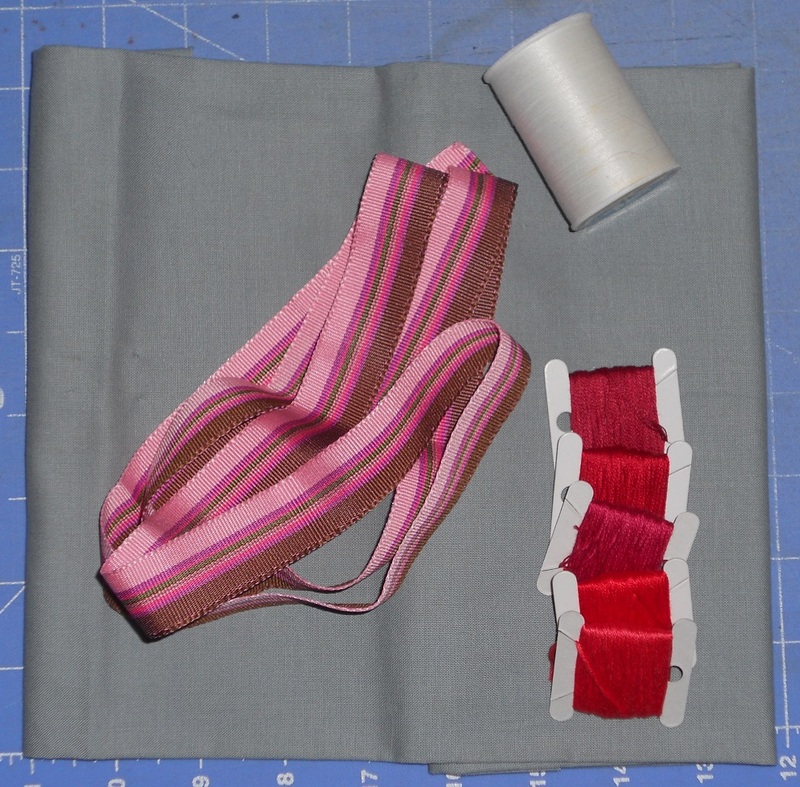 Then I went a little more abstract with ribbon, thread, and wound cards of embroidery threads. If you step back, you can still see the shapes from the original piece, especially since I kept the colors. I got messy. Pepto Bismol is the right kind of pink this and ketchup works for red. Since I finger-painted this onto a white plate I filled in the background. 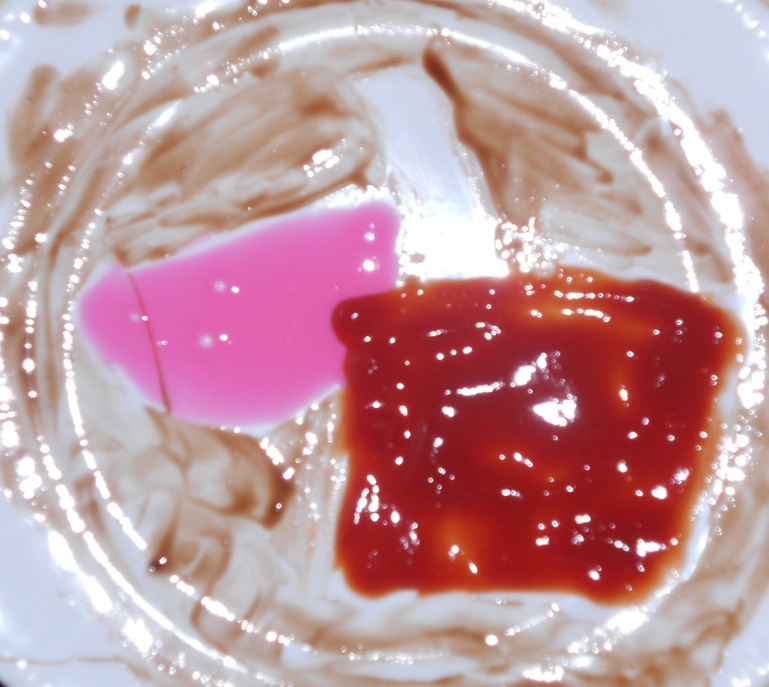 The negative space is chocolate syrup to form around the white shape. While I was in the kitchen, I grabbed a cup for water. I saw the pink plastic one and went searching for more to complete the picture. 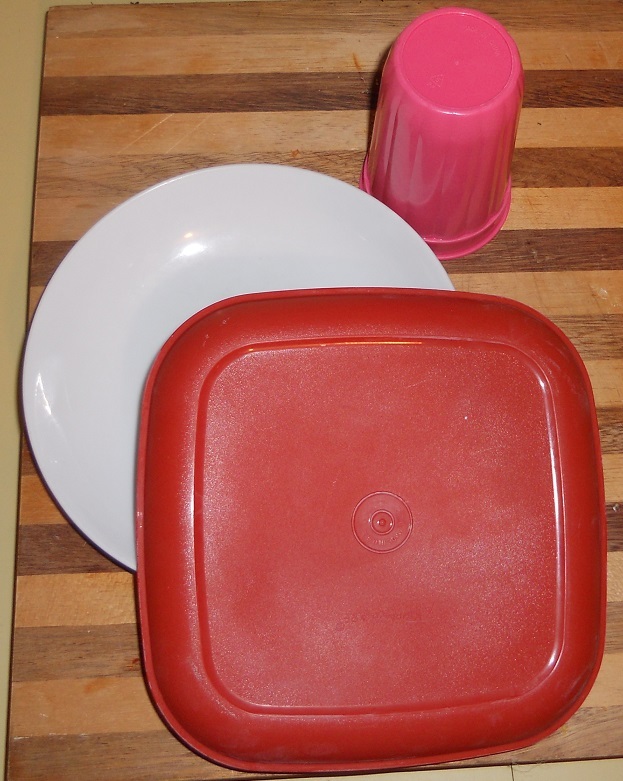 The pink cup became the white shape. 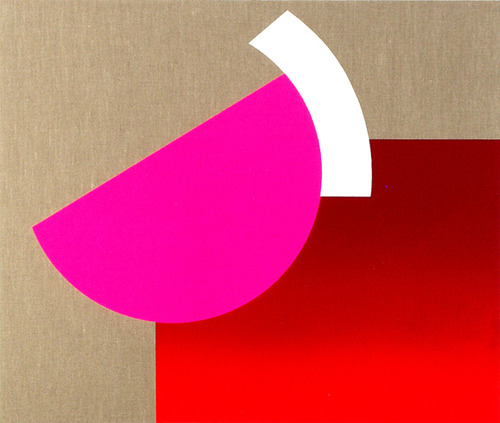 The round plate mimics the pink half-circle as it’s segmented by the red square-ish one. It was fun playing around. I can’t wait to see what my friends came up with! This entry was posted in Art, Artist's Studio, Inspiration and tagged abstract art, buttons, challenges, condiments, creatives, dog, embroidery floss, friends, grey, inspiration, intentionally creative, interpretations, ketchup, pepto bismol, pink, quilters, red, ribbon, small group, thread, watermelon, white on September 30, 2014 by quiltartbymegan. 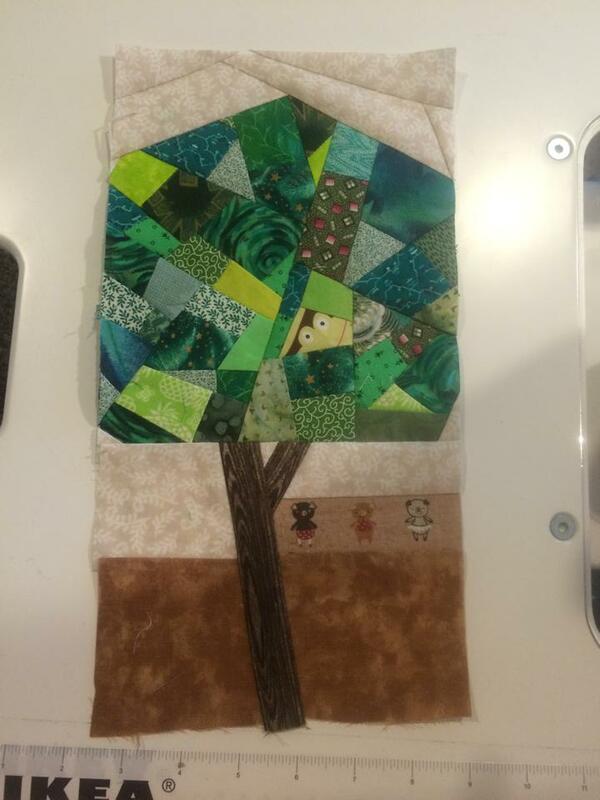 Crumb-pieced fabric is great for I-Spy or Treasure Hunt quilts! Finding the cute little things in my students’ made-fabric was one of the most fun parts about the test class I taught on Saturday. A BIG HUGE GIANT SMOOCHY KISS to my friends who not only allowed me to use them as lab rats, but who gave me invaluable input on how to do and not do things. Terminology matters and having clear examples does, too! Anyway, on to the fun part of this post. Three of the artists in attendance sent photographs so I can share them with you guys. I’ll tell you about the fourth’s project first. We’ll call her “M.” Get your imaginations ready because *gasp* I didn’t have my camera in class. This talent made her crumb pieces in the leftover fabrics from working on an appliqued and embroidered mermaid. 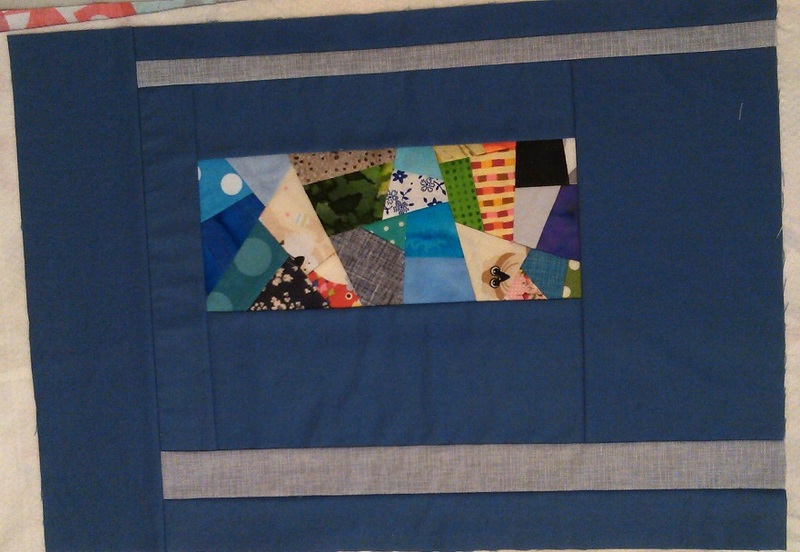 M is still working on blinging-up that center and will cut the crumb pieces into a 1″ border for it. It’s going to look so good! Here’s a sample of Z’s creations. 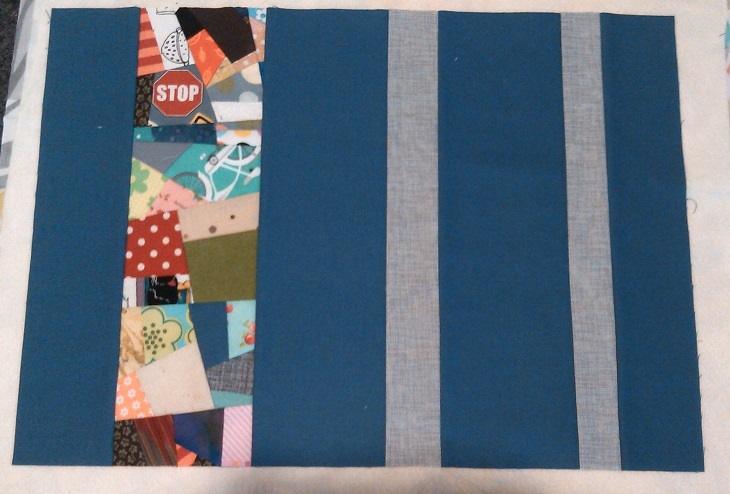 This quilter decided not to finish the crumb blocks into something, yet. Z said that the improvisational piecing technique of making these without a pattern helped her feel artistic. She making the pieces so much that (in the heat of the moment, maybe, but maybe not) they might make a fun bed-sized quilt. So Z is saving what she made in class to merge with more she’ll make during her home-sewing time. Can you see the tiny triangle? It’s so cute! 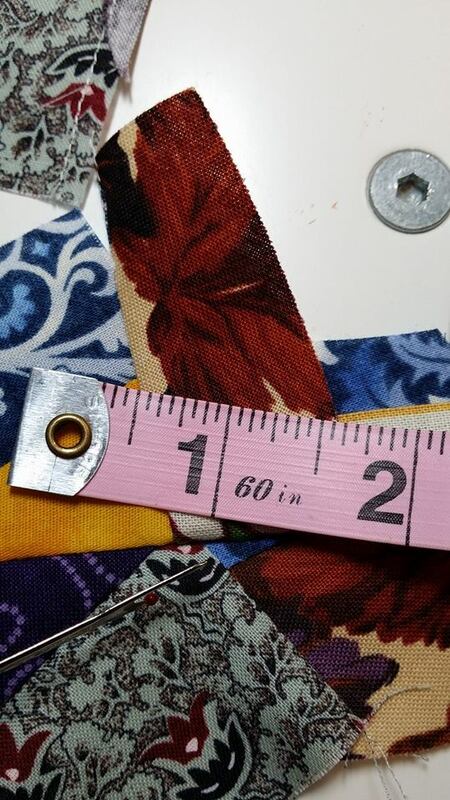 And no, it’s not made from a 1/4 inch piece of fabric… it’s all in how you sew the pieces together. P made this little tree, inspired by a photograph a friend shared online. Like M, she used a limited color palate for her scraps. This time they’re all greens. P also worked on another tree, this one with little dancing ladybugs on the ground. We’ll see if they end up as wall art, a pillow, or something else! Can you see three pigs? How about monkey eyes? “A” made two place-mat tops in class. I love the blue and tan that she used to keep them cohesive and clearly a set! By the time I asked for photos, A had made two more. So here’s her set of four very modern-looking different but the same place-mats. Can you find the words “Bug Off” and “Moo”? How about a dog’s face, a circle of flowers, a bicycle and a stop sign? What else do you see in these crumb blocks? I’d love to know which pieces catch your eye. 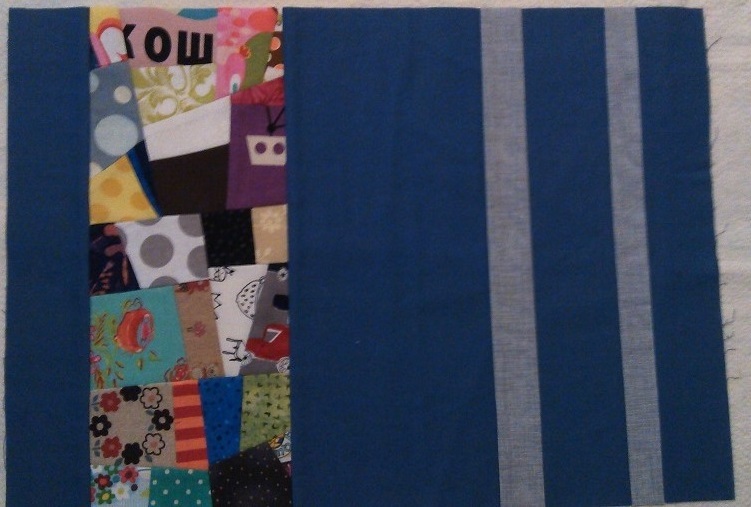 One of Z’s scraps stood out to me because I used that same fabric in a baby quilt. If you love the look of crumbs but aren’t a quilter, aren’t local, or just have too many projects on your list already, check out my etsy shop. There are lots of things in there that have these crumb-fabrics. I also do custom orders so if there’s something specific that you want just let me know! 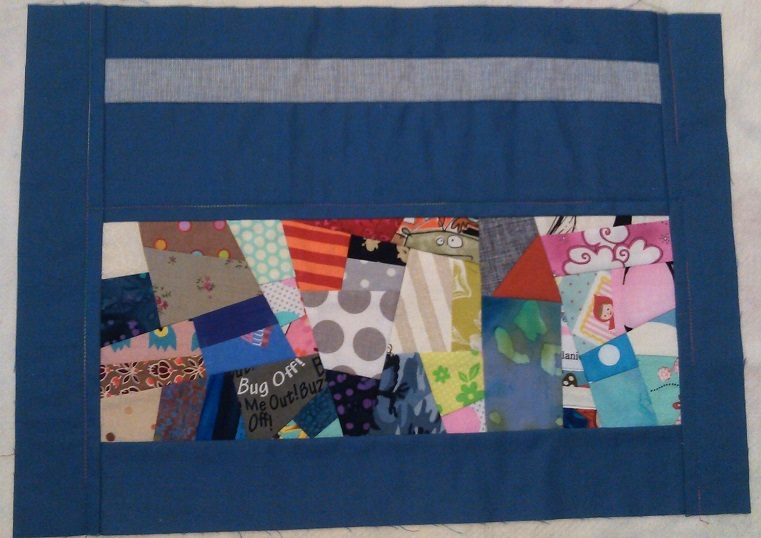 This entry was posted in Art, Collaborations, Critiques, Crumb Quilting, The Business and tagged bed quilt, class, crumbs, crumbs fabric, find it, friends, I found, I-Spy, learning new techniques, lookie, made fabric, modern placemats, pieced border, SLO Creative, teaching, technique, test class, treasure, treasure hunt, tree on September 17, 2014 by quiltartbymegan.